I ate my first wild foraged fiddleheads a few nights ago and I’m still alive! Must have got my identification correct. Yay! In all seriousness, a fiddlehead is not going to kill you, but it might upset your stomach. I had to do a fair bit of research on fiddleheads before I was ready to go looking and eating because I had heard (I don’t know where or when) that fiddleheads are always a risky thing to eat. This is a classic case of communal fear, where a lot of rubbish gets piled precariously on a grain of truth. Fiddleheads are a popular spring treat, especially in Eastern Canada, and are very good for you. As per this Agriculture and Agri-Food Canada reference, fiddleheads have antioxidant activity, are a source of omega-3 and omega-6 fatty acids, and are high in iron and fibre. 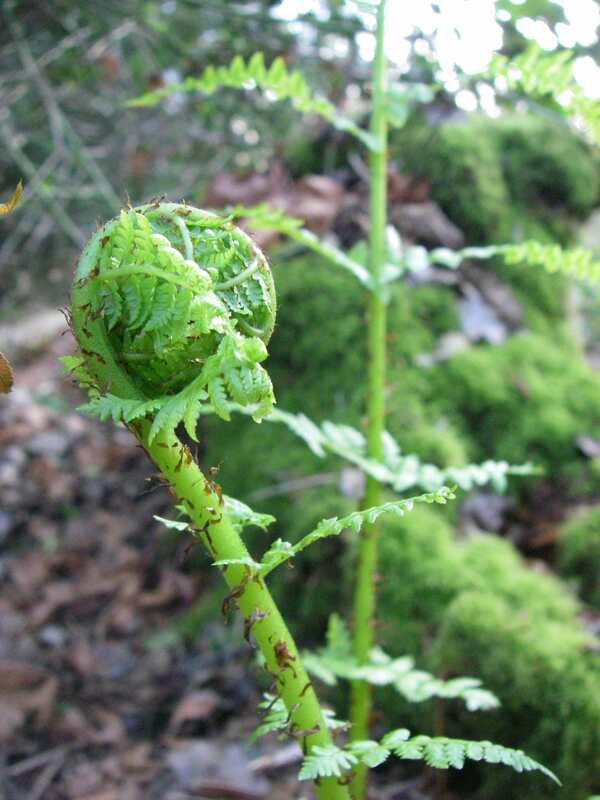 “Fiddlehead” is a general term referring to the furled baby fern (crozier) that shoots up in the spring and can refer to any number of types of fern. There are many different varieties of ferns eaten as edible “fiddleheads”. Some are considered more likely to be dodgy, like the Bracken Fern, but “edible fiddleheads” usually refers to the Ostrich Fern and sometimes the Lady Fern. All three of these grow locally in British Columbia. The most common ferns you’ll come across in and around Vancouver that have fiddleheads are the Sword Fern, Bracken Fern, Lady Fern, and Ostrich Fern. When hunting for fiddleheads you’re looking for Ostrich Fern first, Lady Fern second. Don’t go for the others. Sword Fern is not considered edible, but I have read that the tubers can be peeled and cooked. It is the most common fern round these parts and the largest. It sort of has a crozier shape, but its stem folds over like a flopped hand on its way up. It’s also covered with a lot of bitter brown papery bits – it just does not look like a classic fiddlehead at all. Common west of the Rockies, the Bracken Fern is known to have carcinogenic compounds and is probably best avoided, although it is eaten in some countries, like Japan. Its fiddle head has a distinctive look, so don’t worry about picking it by accident. They kind of look like an alien hand to me as each frond unfurls like a finger rather than the classic crozier look. When you see an unfurled Ostrich Fern, you see exactly how it got its name. It is very feathery looking and delicate, with the fronds coming out on either side of the stem at the same point. The Lady Fern fronds alternate along the stem. Urban Huntress Tip: I found this fantastic document from The Alaska Department of Natural Resources about fiddlehead ferns. Print it out in colour for a walk in the woods. I found these Lady Fern fiddleheads in the UBC endowment lands, but I’m pretty sure you’re not actually allowed to harvest anything (including mushrooms) from there. Of course, people do. You’ve been warned. I’ve been told by a member of the Vancouver Parks Board that our city parks are fair game when it comes to foraging and they don’t use pesticides anymore. With that in mind, Jericho may be worth a look. Fiddleheads must be cleaned thoroughly and cooked before eating. Boil for 10–15 minutes or steam for 10–12 minutes (until tender) prior to consumption, and the water used for cleaning or steaming should be discarded. Uncooked, some ferns can contain the enzyme thiaminase which breaks down thiamin. Clean fiddleheads by gently agitating them in a bowl of water. Both the Ostrich and the Lady Fern can have brown papery bits on them (although Ostrich will have hardly any). These are bitter tasting, so remove them by rubbing them off with your fingers in the water. My batch had a lot of brown bits and it was pretty time-consuming to get them off. Never collect more than half of the fiddleheads arising from an individual root. I think the fiddlehead season only lasts a few weeks, so go for a walk in the woods this weekend and have a look around. There’s a lot of fear mongering when it comes to “wild” food. Caution is wise, but challenge yourself to at least learn something new. Do some research. Get an identification book. Go for a walk and see what’s what. Trust your instincts and take baby steps if you need to take baby steps, but take steps in the direction of something new. Great blog post! We picked wild Lady Fern Fiddleheads this week and sauteed them up for dinner! Wild foods always taste so good! I hate to say it, but I think some of the ferns in your photos are misidentified, and some of your fern information isn’t quite right. The alleyway fern doesn’t quite look like ostrich fern — it usually is wider at the top of the frond than the bottom. 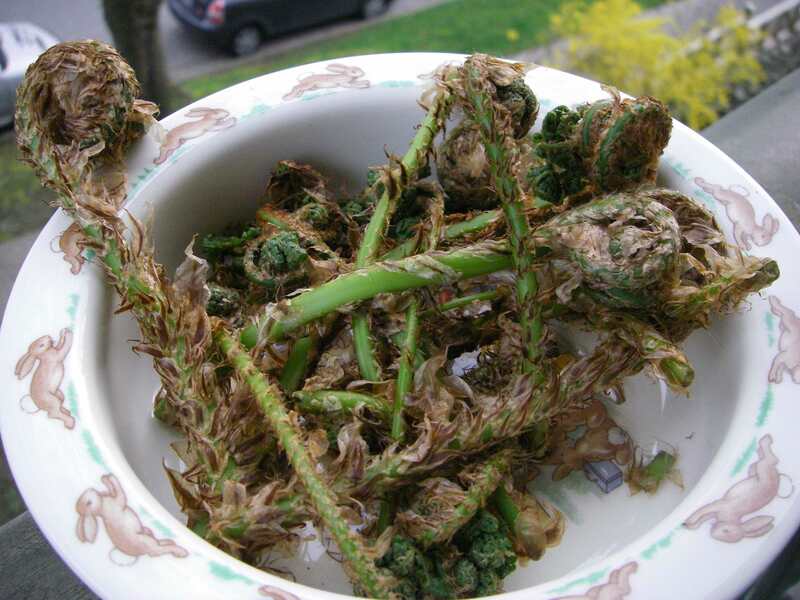 And the fiddleheads in the bowl are actually spiny wood fern, not lady fern. Also, while ostrich ferns do grow wild in BC, they’re rarely seen on the south coast — unless they’re in someone’s garden. For the record, the “UBC Endowment Lands” is actually Pacific Spirit Regional Park, a protected area, and it’s illegal to harvest any plants from there. There are all kinds of wildlife that depend on them — from salamanders to butterflies to birds and more. There are non-protected places to harvest from. Or you can always grow ferns for eating — it’s a more ethical way to go. / what cdndawn said – the spiny wood fern can be discerned from lady fern by a few traits – spiny wood ferns are darker green and have what looks like pollen already developing in the fiddlehead stage, whereas lady ferns don’t develop pollen until they are fully unfurled. Bracken fern have been eaten for centuries by Koreans as well as Coast Salish people. They have to be processed properly to denature the cyanide compounds. In my opinion the fern in the alley is indeed ostrich fern. “Crown Land” is a good place to wildcraft, although I think it’s important to acknowledge that this label does not necessarily mean the land actually belongs to the ‘crown.’ In fact, 95% of the land in BC is, according to our government, unceded Coast Salish territory. Vancouver is literally situated on Musqueam land – and legally, on paper, it says so. The Musqueam people don’t get any rent money from it. Places to forage gets tricky. If you’re doing it gently, and spreading the wealth and knowledge, then I think you should be able to do it anywhere. The thing is, collecting HALF of a crown of a lady fern plant will seriously diminish it for the following year. I recommend a maximum of 30% – which means that if a crown has 5 fiddleheads, you should only pick ONE of them. This allows fellow wildcrafters after you to have an opportunity to harvest a small amount and if they only pick one, the plant will still be healthy next season. It is really important to respect conservation areas and other sensitive places like those on the edges of big cities with lots of traffic and exposure (ie. Pacific Spirit Park). Haven’t got around to updating the text re: spiny wood fern. I wasn’t aware of it at all until cdndawn pointed it out. I’m not personally familiar with the Christmas Fern, Jimmy. The only mention I found about their edibility suggested not eating them. Sorry, I can’t be more helpful. Thanks so much for the tips! I foraged and made a delicious fiddlehead and bacon recipe. I also linked to your site to help others forage for this little beauties – thanks!